The political economy of land is changing rapidly in the Mekong region, as it is worldwide. Economic development, along with the introduction of new land tenure systems, are transforming communities and driving land scarcity. Government grants of large land concessions to investors, land speculation, forestry exploitation and internal migration all impact rural communities’ access to the land and natural resources vital to their livelihoods. The lack of recognition and safeguards of customary tenure practice and rights is one of the most contentious and complex issues in the Mekong. Weak tenure governance is especially detrimental to rural communities, indigenous people and ethnic minorities that may have customary tenure rights but lack formal recognition. The remedies are as complex as the problem. They require an adequate policy and legal framework to support the governance of land and natural resources, together with competent and responsible national and local level institutions. Citizens must also be aware of their rights and how to exercise them. The private sector must also be aware of the rights of communities and their responsibilities toward them. The Voluntary Guidelines for the Governance of Tenure (VGGT) are an important international reference when it comes to the recognition of customary tenure by states and by other stakeholders, particularly investors. This online dialogue focused on exploring the challenges and opportunities related to the recognition of indigenous, ethnic minority and community tenure rights in the Mekong region. Participants will examine the status of community tenure rights and share ideas on how to strengthen them. Compared and contrasted regional and international contexts and experiences in customary tenure recognition that can inform potential strategies and actions at country and regional level. Generated a regional level synthesis of key challenges and opportunities related to community tenure in the Mekong region that will be shared broadly. What is customary tenure? Is it the same as “traditional tenure arrangements of indigenous people/ ethnic minorities"? Why is securing customary tenure rights important? To differing extents, there are policies recognizing customary tenure in all countries in the Mekong region. However, progress towards securing indigenous, ethnic minority and community tenure rights has been hampered by the cumbersome requirements for achieving formal recognition, reflecting in part the tension between local and state authority. In your opinion, what would be required to strengthen the recognition of indigenous, ethnic minority and community tenure rights in the region? Since it takes a long time for regulatory revisions recognizing customary tenure to be made and implemented, how effective have interim protection measures been? What are some examples? We know that in customary systems there is often a mixture of communal land (e.g. collectively managed shifting cultivation areas and forest areas) and plots claimed by individual families (e.g. paddy land or upland plots with long-term crops). What is the best way to recognize the variety of tenure rights in customary systems? Customary systems, particularly norms governing the internal management of communal land, are often characterized as having higher levels of equality compared to private property regimes. Nevertheless, customary systems may also exhibit gender inequality and/or other forms of exclusions as a result of local power dynamics. How can statuary recognition of customary rights ensure that equity considerations, including principles of transparency and inclusive decision-making, are adhered to in customary systems? There are concerns that the recognition of customary tenure, which sometimes lead to unique categorizations of “indigenous” land where communities can continue to practice “traditional livelihoods” (in some cases with restrictions on community involvement in commercial activities), may not help alleviate conditions of poverty, food insecurity and vulnerability experienced in many communities. Is it possible to combine recognition of customary tenure rights and forestry/agricultural development through investment/commercial activity? Are there examples where this has been done successfully? What strategies can be taken to defend, strengthen and promote customary rights in the Mekong region? How can regional dialogues facilitate greater recognition of the rights and priorities of local communities, including addressing issues of power and politics? The dialogue is open to anyone with an interest in land issues. To make a contribution to the discussion, first register with the link below. Please feel free to answer as many questions as you like and then upload your contributions to the dialogue. You are welcome to make more than one contribution. Your contributions should be brief – not more than 500 words, and may be shorter. You may also query other participants and comment on their contributions. 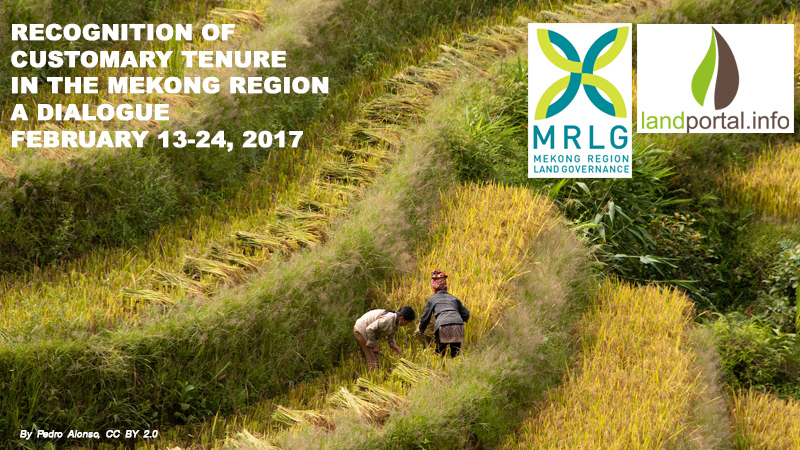 This is the first of a series of dialogues on land issues that the Mekong Region Land Governance project (www.mrlg.org) will be hosting together with the Land Portal this year. We are glad you have joined the discussion and hope that the free exchange of ideas and experiences will evoke new thoughts and conversations to enlighten the challenges of customary tenure recognition. The dialogue will be archived for your reference and learning. A summary report will also be made available online at the conclusion and will contribute to an upcoming regional workshop on customary tenure. The over-arching goal of this multifaceted process is to contribute to practical solutions for the advocacy and recognition of customary tenure across the region. We hope to hear from you during this dialogue, new thoughts, questions and comments on contributions are encouraged! Thanks for participating. Customary tenure – sometimes known as informal, indigenous or traditional law - may be defined as the local rules, institutions and practices governing land, fisheries and forests that have, over time and use, gained social legitimacy and become embedded in the fabric of a society. Although customary rules are quite often not written down, they may enjoy widespread social sanction and may be generally adhered to by members of a local population. More than two billion people worldwide access resources through customary tenure regimes. In many contexts, communities administer, manage and transact their tenure rights primarily within the bounds of local, customary paradigms. In the past, different countries considered that with time and modernization they could simply suppress customary tenure systems, sometimes deemed as backwards and inadequate, replacing it with statutory systems based on titled private property. Experience has shown that this is not realistic, useful and neither desirable since customary tenure systems have attributes and strengths that respond to real needs in many countries. For instance, in areas where state administration and infrastructures are absent or inaccessible, customary tenure systems are often the primary means of enforcing rights and resolving tenure disputes, playing therefore a fundamental role. Customary tenure systems are extremely diverse, reflecting different ecosystems, economies, cultures, spiritual values and social relations. However, they tend to embed tenure rights in social relationships and to place considerable emphasis on collective rights, vesting tenure rights with often multiple, overlapping and, therefore, “nested” social units (i.e. individual rights within households, households within family networks, family networks within wider communities). Customary tenure systems may be associated with indigenous systems of shifting cultivation, but also pastoral resource use, communal forests and sacred or burial sites. When customary tenure systems are undermined, rural people may lose access to natural resources that are critical to their livelihoods, spawning resistance and increasing poverty among already vulnerable populations. This process is accelerating due to multiple reasons, including population growth, climate change, large-scale land investment when national and foreign companies seek land in remote communities, commoditization of forest resources and ecosystem services, urbanization and peri-urban development leading to the creation of new land markets. The Voluntary Guidelines on the Responsible Governance of Tenure of Land, Fisheries and Forests in the Context of National Food Security (VGGT) encompass a series of provisions internationally recognized as instances of good practices for the protection of customary tenure. Recognizing and respecting all legitimate tenure rights is the first of several “general principles” of the Guidelines, followed by: safeguarding all legitimate tenure rights against threats and infringement; promoting and facilitating the enjoyment of legitimate tenure rights; and providing access to justice to deal with infringements of legitimate tenure rights (par. 3A). The VGGT clearly states that customary tenure rights can constitute legitimate rights calling on states to recognize and respect “legitimate customary tenure rights that are not currently protected by law” (par. 5.3). The Guidelines explicitly consider as “legitimate” not only those tenure rights formally recognized by national law, but also those rights that, while not currently protected by law are considered to be socially legitimate in local societies (see par. 4.4. and, 5.3 and 7.1 and Table 2.1). They also provide guidance on how to recognize customary tenure rights (see par. 9.5 to 9.8 and 9.11). Alden Wily, L. 2012. Customary land tenure in the modern world rights to resources in crisis: reviewing the fate of customary tenure in Africa–Brief #1 of 5. Washington, DC, RRI. FAO. 2011. Communal tenure and the governance of common property resources in Asia, by K. E. Andersen. Rome. Land Tenure Working Paper No. 20. FAO. 2012. Voluntary Guidelines on the Responsible Governance of Tenure of Land, Fisheries and Forests in the Context of National Food Security. Rome. FAO. 2016. Responsible Governance of Tenure and the Law: A Guide for Lawyers and other Legal Service Providers. Rome. USAID. 2011b. The future of customary tenure: options for policymakers. Property Rights and Resource Governance Briefing Paper #8. Washington DC. This has of course been the case in much of the Mekong region where until relatively recently many groups lived far from roads, had little to no infrastructure, and had few if any services. So of course, the rapid expansion of infrastructure and accompanying waves of migrants and development projects do pose a direct threat to customary tenure. Despite the VGGTs, there still seems to be too little recognition that land rights of indigenous and local communities are crucial in ensuring peace and prosperity, development and sound investment. We might ask for instance, to what degree has this been considered in the ambitious transport infrastructure plans of the Asian Economic Community (AEC) at the early planning stages, as opposed to dealing with conflicts and other problems that arise as a result of displacement after a road or rail project is already committed. In most cases the assumption is that the “greater good” trumps the needs of rural and forest communities who are seen to be in need of development. This suggests that a genuine appreciation of indigenous and community tenure rights and its broader values requires a fundamental paradigm shift to be successful in the long term. How is that to be achieved? Customary tenure involves having historical access, and the ability to exclude others from accessing particular natural resources, such as lands, forests, water, fisheries, non-timber forest products (NTFPs), etc. It is not exactly the same as “traditional tenure arrangements of indigenous peoples/ethnic minorities”. Customary tenure is frequently the basis for important local livelihoods, such as agriculture, fisheries, NTFP collection, etc. But to be clear, customary tenure is not only held by indigenous peoples/ethnic minorities, it is also held by non-indigenous/non-ethnic minority communities as well. For example, indigenous communities may have customary tenure over particular forests, but this is also the case for large numbers of non-indigenous communities as well. Therefore, it should never be assumed that customary tenure only relates to particular ethnic groups. In some countries in Southeast Asia, communal land titling is specifically related to customary tenure. For example, in Cambodia communal land titling is specifically designed to support rotational swidden cultivation amongst particular groups of people defined by the state as “indigenous peoples”, and thus only those groups of people have the right to apply for communal land titles. This is despite the fact that some non-indigenous ethnic Khmer and Lao communities also engage in particular forms of rotational swidden cultivation, often in tandem with cultivating lowland paddy rice and other forms of agriculture. In other countries, however, such as Laos, the concept of indigenous peoples is not accepted by the government, and communal land titling is not specifically linked to indigenous peoples or the ethnicity of the group applying for a communal land title. However, even in Laos communal land titling is generally closely linked to customary tenure. As mentioned above, customary land tenure is not specifically associated with indigenous peoples/ethnic minorities in Laos. It is something that peoples have a right to apply for regardless of their ethnicity. Therefore, the policy of the Lao government in relation to communal land titling is not in conflict with the idea of customary tenure. In fact, the policy in Laos provides a much larger group of people with the potential opportunity to use communal land titling in order to protect customary tenure. Everyone has a right to take advantage of communal land titling to protect customary tenure regardless of ethnicity. In Cambodia, however, only indigenous peoples, who make up 1-2% of the population, have the right to apply for communal land titling. Furthermore, in Cambodia the procedures necessary to register a community as “indigenous” are often time-consuming, onerous, and expensive, thus limiting the ability of many communities to become registered as indigenous. Basically, this can only happen with outside funding support. Without being registered as indigenous, there is no possibility of obtaining communal land titles. But in Laos the process of obtaining communal land titling can potentially be much cheaper, quicker and easier, as the difficult step of becoming registered as indigenous is not required. Hopefully the above comments are useful for thinking about customary land tenure and its links to ethnicity/indigeneity and communal land titling. I look forward to your comments. I totally agree with your analysis. Restricting customary tenure to "indigenous people" or "ethnic minority" leaves aside a large portion of the rural population who also depends on customary tenure, especially for communaly used resources such as forests, pastures, or fishing grounds. In fact, in most of the world, including Europe and China, customary tenure have survived and has been recongized as communal by the modern law. To give a few examples, in France 11000 communal forests cover 2,5 millions hectare. In Switzerland, High elevation communal pastures are an essential part of the rural economy and traditional high value cheese production. Ewers (2011) differentiates between two models of communal title in Asia, being the ‘permanent title’ model and the ‘delegated management’ model. In the permanent title model (which includes indigenous groups in Cambodia), land is granted to the community for collective ownership, and does not distinguish between agricultural, forest or other land categories. In the delegated management model (Lao PDR), the state maintains ownership of the land and delegates management to local groups, who typically comprise those using a specific resource such as forest, pasture or irrigation system. Firstly, given your experience in both countries, do you think that Ewer's division reflects the actual situation for indigenous communities? Secondly, what communal titling model (or principles) should the donor community push for in the upcoming Land Law revision in Laos, that will best suit the needs of local communities with existing customary title? I am not sure if you have represented Ewers' views accurately, but assuming that you have, and with all due respect, in Cambodia communal land titling is only for agricultural land and forests to be used for agriculture in the future. Forests not to be used for agriculture are treated separately in the law, and are managed by a different government agency (the Forest Administration). For Laos, it will not be possible to push for full "communal ownership", since rhetorically the government owns all the land in the country on behalf of the people, but a model that would allow for communal titles with similar standing to individual titles, but without being able to be sold, would seem like the best option to push for. The delegated model has not worked well in the past (i.e. Land and Forest Allocation). However, it is hard to know how much land the government would be willing to put in communal/collective titles. If they are only willing to put a little in, communal/collective titling might be more of a problem for villagers than a solution, because the government might claim the rest of the land for themselves. This is a tricky matter that could be a double-edged sword. In Cambodia, some NGOs have become frustrated with the communal land titling process lately because they feel that too little land is being allowed to be put in titles. Some have even withdrawn from the process as a result, because they don't want to be involved in something that actually reduces the amount of land available for villagers, rather than helping to secure more land for them. I think it is worth pointing out that this issue – titles’ incomplete coverage compared to the land that people actually use – came up previously with individual land titling programs in both Cambodia and, more quietly, in Laos, and is now playing itself out with communal land titling. In the late 2000s, advocates for those excluded from individual land titling in Cambodia triggered a World Bank Inspection Panel review, which ended up agreeing with their complaint and digging up an internal review that said basically the same thing. Phil Hirsch summarized the issue nicely with what he called the central conundrum of land titling: people who have titles already usually like them, but titling in one area can actually undermine tenure security in many others. Incomplete coverage, in other words, is the overarching message. This is now playing out in the communal titling process, where as Ian noted, communal titling in Cambodia is limited to agricultural land and thus excludes significant parts of those communities’ land base, such as forestlands. In Laos, experience to date is a bit more mixed, but follows this same trend. (The collective titles issued to displaced villagers on the Nakai plateau include forestlands and cover large portions of the [new] village territories, but this seems to be the exception rather than the rule.) And in both countries, the actual amount of land under communal title is vanishingly small, and -- perhaps even more importantly -- is not increasingly very fast. This issue of coverage (at multiple scales) is, I think, one of the ones to watch. And in this sense it’s notable that spatial data or statistics are still quite rare. A notable but very telling exception is Yun Mane’s comparison below of 10 communal titles per year – a generous estimate – to the more than 573 eligible communities. I think we have to clearly diferenciate between the different forms of incomplete coverage or exclusion. On the one hand, we have the slow pace of land registration activities in countires like Cambodia or Laos, which results in many districts, communes and villages waiting for "their turn" and obviously leading to a decreasing perceived land tenure security in these areas. Phil Hirsch has indeed described this very well. It is not by coincidence that these remoter areas are increasingly the target of new settlers, land speculators, private investors and companies. The process to communal land titling as prescribed in the legal framework in Cambodia with its many main steps and sub-steps is slow by definition and many would argue that this was always intended by the Government. On the other hand we have the systematic exclusion or reduced coverage under the systematic registration approach (e.g. informal settlements, distant plots, any areas with land conflicts) and under the communal land registration. In Cambodia, the statutory recognition of customary tenure in indigenous communities is subject to various exclusions. First of all, any cemetery forest and spritiual forest areas are restricted to 7 ha each, with the rest being either cut off or registered as 'reserved land' under collective tenure. It is important to note that in Cambodia only 5 land categories (land use types) are considered for collective land registration in IP communities: residential land, agricultural land, reserved land (shifting cultivation area and forest fallows), cemetery forests, spiritual forests. This is much more restrictive than in Laos. As Ian pointed out already, the forest areas used by the IP communities traditionally e.g. what is classified as community forest is considered as state land. Although the regulations do not foresee any limitations in terms of overall area for collective registration, the budget provision by the Ministry of Land Management foresee only 750 ha per community. Actually, the second most frequent reason for rejecting applications for collective titling is the claimed size of the area. There is a famous case in Preah Vihear where one IP community claimed 16.000 ha of land under customary tenure. Authorities were shocked and rejected the application. Authorities do not understand the traditionally land use patterns and extensive use of forest areas. Cambodia recognizes communal tenure as a separate ownership regime, but only in IP communities. Yet, when a collective title is finally handed over to the IP community (until now only 14 titles were issued), the title itself consists of a bundle of separate documents, one for each parcel. Often there are as many as 70 to 80 separate parcels. It is important to understand that only the residential land and the agricultural parcels fall under communal ownership, while the cemetery forest, the spiritual forest and the reserved land are registered as "private state land" and allocated to the community. So there is a mix between permanent communal tenure and "delegated management" in any of the IP communities. Another interesting element in Cambodia is the fact that communities with customary tenure are increasingly faced with new settlers joining the village. This poses enormous strains on the IP communities. A large percentage of the 573 communities mentioned by Mane are in fact old or new "mixed" communities. Officially Khmer settlers are not permitted to join communal land tenure arrangements. When collective titling takes place their land is excluded and their tenure security decreases. There are no provisions at present on how to deal with such cases. The descriptions of the requirements for issuing communal land registration in Cambodia provided so far are as is. The steps are tedious and the legal foundation comprise altogether what is found in the brackets (the Land Law, 2001; Sub Decree 83 on Procedures of Registration of Land of Indigenous Communities, 2009; Sub Decree 118 on State Land Management, 2005; Sub decree 46 on Procedures to establish Cadastral Index Map and Land Register, 2002; Instruction relating to the Implementation of the Procedures of Establishing the Cadastral Index Map and the Land Register, 2002, Prakas on Identification, Mapping and Classification of State Land, 2006, Art 6.3 of Circular 02 signed by PM on 26 Feb 2007 on Illegal Occupation of State Land, 2007 and Inter-ministerial Circular on Interim Protection Measure Protecting Lands of Indigenous Peoples that has been requested for Collective Ownership Titling, while awaiting Titling Process according to Procedure to be Completed, May 2011). Out of all this, Sub decree 83, 2009 (PROCEDURES OF REGISTRATION OF LAND OF INDIGENOUS COMMUNITIES) is the important one Careful reading of this will show the possible need to look at the governments' land classification systems and how they are perpetuated or annulled in commual land tilting and what the implications are. This can be discussed. For Cambodia it should be noted that the government has carried the classsification of 'state private land' and 'state public land' into the communal title. It puts land presently under cultivation this year when the land survey is done in a shifting cultivatation commmunity as state private land, while land that is "reserved" i.e. lying fallow being an indispensable part of the agricultural system, is classified as state public land. Also spirit and burial forest included in the communal title are still state public land under the Forest Administration. The implications of perpetuating the state land classification into the communal titling means that all reserved land in the communal title which may make up 50 per cent plus the spirit and burial may be lost to the community if it dissolves. Then the government can take back all state public land even though these parcels may be under cultivation in the given year. Issues of the government's Economic Land Concessions grabbing pieces of communal (reserved) land in Mondulkiri province may be linked to a government perception of these pieces being state public land. Also the Lao government's prior classification of land that is seen as the land eligible for possible future titled customary communal land is important. Looking at the title deeds of the famous Sangthong Community in Lao PDR one can read in the heading of the gold framed title deeds that this still is land of the 'rat' or government. The land classification is of course also closely linked to the jurisdiction of the line ministries, so even though a community in Myanmar or Lao see all its territory with agriculture, fallow, and forest under customary community based tenure and would want it registered as such there is no single govt agency which can do that as agricultural land and forest are under two different ministries in Myanmar, two diffferent departmens/administrations in Cambodia, In Lao different kinds of forest are under two diffferent ministries with agriculture under one of them while land administration under the other ministry. I fully agree with your statements on communal land titling in Cambodia. Just a small correction: in the more recent cases of issuing a CLT, the Cambodian Government has classified the entire "reserved" land of the community as "private state land". In each case this means that a separate sub-decree has to be approved by MAFF or MoE on the re-classification of these areas from public to private state land. This adds to the very lengthy and cumbersome process of issuing a CLT. It is definitely true that IP communities face the biggest challenges in protecting the "reserved" land from encroachment, partly because of the sheer size of the area (usually over 50% of the communal land area) and also because of the reduced tenure security by classifying this part as state land. You are absolutely right when you state that government could take this land back once the community dissolves or if an ELC shows interest in these areas. For the case of Sangthong in Lao PDR please note that the former NLMA used the format of the "Temporary Land Use Certificate or TLUC" for the allocation of the bamboo forests to the communities in Sangthong. At the time and even until today the format of the communal title deed to be used in Lao PDR has not been finalized. The TLUC is not a legal title deed and has a validity period of 3 years only, after which period it is supposed to be replaced by a permanent title deed. So legally speaking the communities of Sangthong have already lost their tenure rights to the forest areas. In Cambodia, it can be argued that 5 line ministries are directly concerned in the process of communal land titling, namely Ministry of Rural Development, Ministry of Interior, Ministry of Land Management and MAF and MoE for the re-classification of the state land. In Lao PDR the situation is somewhat easier with only 2 line ministries involved (MoNRE and MAF). Good to learn that the RGC now classifies reserved land in the communal title (i.e. the fallows in many cases) as state private land. I did not know this happened. Years back, when asking a Ratanakiri MLMUPC officer about the status of the reserved land in the cadastral index map for the village of LaEnKren which was on display he said this is state private land. He just followed his own logic not aware of the text of the Sub decree. Another issue to raise for Cambodia is the high cost of the sporadic land registration of indigenous communities' communal land. As you know from GIZ, the cost of one registration for one community often ran into 30,000 USD. With no donors paying any longer (to my knowledge), the progress is bound to be extremely slow. So perhaps for the ongoing MRLG discussion of possible registation of customary communal tenure it would be good to have estimates of costs based on teasing out the elements and steps envisaged. Shifting cultivation communities would have to wait a long time if each and every parcel, including all the fallows, were to be subject to cadastral survey. In Cambodia it was done with donor funding. In Myanmar the tracts are much larger and boundaries of ten year falllows are no longer clearly visible. And the mountains are high and steep, e.g. Chin State. Sophorn writes her in his comment about the Interim Protection Measures in Cambodia and the diifficulties. However, some kind of interim protection measures would be needed in Myanmar, but no regulatory framework in place for this. Thanks, Florian, for these elaborations -- very interesting about the mixture of direct and delegated/state ownership when it comes down to the legal specifics. Just a quick note to follow up on the end of your post: in the study that we did last year, my colleague and I described one such example of the last type of village you described, although in this case the entire village had been rejected from the communal land title process because it was seen as a mixed (rather than indigenous) community. This is described on pages 19-21 at the link above. Actually, the Lao government may be reluctant to put too much land into communal/collective titles. In March 2015, the World Bank/Finland SUFORD (Sustainable Forest and Rural Development) project prepared draft Guidelines for registration and communal titling of village use forests in production forest areas. It stated that "The final outcome of the process described in the guidelines would be a community land title to the village use forest issued in the name of village" (p.3). However, the document has not proceeded beyond the draft stage and realistically will not be approved “as the government has no will to revisit the past.” according to a source that I interviewed recently. The past referred to here is FOMACOP (Forest Management and Conservation Programme), which ran from 1996 to 2000, and was designed to decentralise the management of forests to local communities, in return for tax revenues. However, it was not extended by the Lao government due to concerns over profit sharing and equity between villages. For those not familiar with FOMACOP and SUFORD, a useful analysis is given here. While there has been a growing trend to afford legal recognition to customary law governing land tenure, the means by which the Mekong countries have done so is notably varied. Within the Mekong region, countries like Cambodia and Vietnam have sought to codify dominant forms of customary tenure and either fully or partially replace the role of traditional authorities in land administration with formal, state-sanctioned administrative bodies. Another model is one where community areas are delimited and traditional governance institutions are allowed to continue to administer land according to customary practices, but such ‘permits’ are rare and found wanting to address the challenges overall. 1. A pro-poor approach to protection and recognition of customary rights is fundamental. Because the majority of those holding customary rights are economically poor (close to 60% in the region), most depend on common property resources, are vulnerable to State and elite manipulation, and largely subordinated to state and elite power. 2. Comprehensive legal reform is a priority. As long as individuals, families, and communities hold land and resources that do not have legal force as properties in this highly commoditised and globalised economic system, the majority will remain as “illegal” holders or merely tenants of the state in their own lands. A more strategic and sensible approach is to ensure that customary rights to land are protected – and that those holdings have the force of modern real property, whether registered or not. 3. There must be measures to further democratise land administration and management, and build community confidence on the processes initiated. This should include enabling institutional mechanisms and powers to build cohesiveness and solidarity within and between communities. Civil society can play an effective role in building a bridge between the state and communities. 4. Securing benefits for indigenous, ethnic, local and marginalized groups should be a stated priority. A clear benefit-sharing arrangement with local communities on management and use of land resources is critical. In such circumstances it should be difficult for local elite and others to usurp community benefits. 5. Working with the government and educating policy makers is a must. In recent years, government misconceptions on indigenous land rights have been changing and can be helpful for policy reforms. Concerned government agencies should, therefore, be nurtured to challenge misconceptions and stereotyping among local institutions and stakeholders. In moving forward, more work is needed to build understanding among policy makers of operational best practices from past experience. There is a danger that the attention being paid to tenure rights could be short-sighted fixes. Civil society can share lessons learned and provide policy advice to ensure that efforts to strengthen tenure security are able to reach the necessary scale to impart real benefits. 1. Making the new regulations and guidelines on customary tenure understandable and useable by state agencies to secure policy support. In parallel, there is a need to instill procedures where government agencies can receive claims from local communities, review and accept them as field evidence. 2. Mainstreaming indigenous and community tenure rights within government’s tenure and forest reforms. 3. Improving local capacities of respective governments (national and subnational) and non-government actors to gather information on land ownership patterns and socio-cultural factors that affect them. Taken together, the effects of poor land and forest governance, conflicting legislation, and the lack of political will to adequately address socio-economic inequities and bias are major barriers in addressing the livelihood needs and rights of communities holding customary rights. It is important that political will at the national level is galvanised to ensure that legislation within and across sectors is coherent with regard to sustainable use of land and natural resources, and protection and recognition of customary rights. This is particularly important in enhancing people’s political-socio-economic-cultural rights and in strengthening their livelihood opportunities in a sustainable way. Customary land tenure existed in the wetland areas have been largely disappeared due to large-scale infrastructure development project. For example, the so called, Khong Chi Mun water diversion project introduced in the mid 1990s in the Northeast region of Thailand that constructed more than 15 major dams and reservoirs in has devastated wetlands where local people have significantly depended on for their livelihoods and customarily owned these resources. Hence, rights over wetlands are complex in Rasi Salai areas. There are two overlapping types, individual and communal. The first is traditionally owned and known locally by villagers in the community. The owner has a right to use, exclude unauthorized people from his or her land, control how to use land, earn money from land, protect land from some illegal action of others, pass down his or her right to their successors or allow someone to use part of the land right such as sharecropping. The later one is a system in which wetlands belongs to the whole community such as lands in the forest and by the river. To local people, whatever what types of customary land tenure in dam-affected areas, Rasi Salai and Hua Na dams, customary wetland tenure is considered as their social, political and economic structures. It represents social system and relationships as well as local code. With this, local people hold customary tenure in wetlands. They express their ownership, possession and access. They also regulate, use and transfer it over generation. Customary rights over wetland areas are enormously resilient, contiguous and flexible. Land owned under customary tenure is usually in big sizes, having multiple uses, owned and used communally and therefore holding the livelihoods of many inhabitants. Tenure under such systems is communal with a contextualized system of governance – clan, family, life style and chiefs among others and specified gender roles associated with such land. Customary tenure therefore bears social, cultural, spiritual, economic, environmental and political value of its holders and is symbol of social cohesion. However, in the context of the present waves of land reforms across regions of the world, focus is placed on economic land use where customary tenure is considered a less optimal land use system which leads to investiments being initiated without any consultations with the land owners who often have no legally recognized teure security. The voluntary Guidelines on Responsible Governance of tenure of land, fisheries and forests encourages states to recognize or allocate tenure rights by first identifying all existing tenure rights and right holders. In order to achieve such tenure recognition and even documentation the process needs to be participatory and inclusive. This could be followed by awareness on what such tenure rights imply to the rights holders. This is important in enabling them be part of the current wide spread land investment discussion initiatives where their land may be concerned. Systems could be put in place to issue customary tenure land titles through which communities are gradually drawn into sustainable land use systems that ensure promotion of peace and their food security for customary tenure right holders. Recognition of tenure rights should not destabilize the social life of inhabitants but gradually change their livelihood for better. What is customary tenure? It is a compendium of cultural norms, beliefs and practices relating to the what, who, when, where, why and how land is used by a people. It is customary because it entails lifelong practices, which can be pre-legal or post-legal in origin. In Myanmar, customary land management systems are most prevalent in upland ethnic minority areas. Communities practicing customary land management have been living on their lands for many generations, and have passed their lands and traditions on to their children and grandchildren. Customary systems have sustained strong connections between people and their land. These systems provide ecologically sustainable and self-reliant livelihoods and effective decentralised and participatory governance and judiciary systems. Most have been left undisturbed by any formal government intervention and have maintained the ecological integrity of land and resources without outside assistance. Community members regard land as more than a commodity; it is connected to the nature that has produced these resources. They have developed a relationship with their specific natural surroundings over generations. This relationship cannot be replicated or reproduced if they were forced to move to a new location. a lack of constitutional recognition. Furthermore, the current National Land Use Policy is unclear on issues of customary land management, and no laws have emerged from this policy yet. There are also overly complicated administration systems in place dealing with land policy. 1. In the long term, ethnic customary land management systems must be enshrined in a future federal constitution and decentralised legal framework. This would include formal registration of customary/community land titles based on village boundaries, incorporating ownership and management of all natural resources, including those under the ground. 2. In the shorter term, in order to protect customary lands and systems until peace accords, constitutional amendments, and new land legislation have been finalised, there should be a moratorium on land acquisition in areas where customary land management systems are existing. This would serve as an interim protection measure. to reject individual land titling by any authority where these titles are incompatible with the local system, without harassment from authorities. 4. The Central Government should practise non-interference with existing Ethnic States’ customary land administrative structures and policies until new structures have been created. 5. All land management systems in Myanmar should ensure that women have the right to inherit and own land and participate in decision-making, and that international human rights principles are followed and enforced. 6. Interested organisations/agencies/NGOs, both within Myanmar and internationally, should support community-led initiatives to document and advocate for legal recognition of customary land management systems. Customary tenure is the basis for people to be close with land and forest for thousands of years. The indigenous people have set up a code of conduct to natural resources without affecting their offspring. However, the people’s right of land management is impacted by unreasonable land distribution, illegal exploitation and land expropriation by industrial projects, etc. The influence of external factors on each ethnic group is different from each other, in which the traditional institution plays a very important role. The communities with strict customary law, strong solidarity and good understanding of law will protect their traditional land and forest without being affected by the outsiders. Uyen Phong community in Quang Binh province, Vietnam is a clear demonstration in land protection. During the past 30 years, the government has issued many policies on recovering land and allocating that land to enterprises, cooperatives for logging. However, the community disagreed with those policies. They have prevented outsiders from logging. Besides, some local people have been assigned to protect the forest. As a result, their traditional land and forest have been well protected with various specious species and high biodiversity value. Especially, the forest provides enough water for living and cultivation of the entire community. The Government has recognized the values of customary tenure of Uyen Phong community. Accordingly, 90 ha of traditional land of Uyen Phong community was granted the certificate of land use right in 2004. The local people, therefore, play an important role in protecting their rights of traditional land use. It is necessary to help people to realize the importance of their current customary tenure and promote their confidence and solidarity to protect their traditional rights. Besides, it is suggested that the authorities at all levels should respect the customary tenure and people’s involvement in the implementation of policies on natural resource management. I prefer FAO’s definition on tenure as: Tenure systems define and regulate how people, communities and others gain access to natural resources, whether through formal law or informal arrangements. The rules of tenure determine who can use which resources, for how long and under what condition. They may be based on written policies and laws, as well as on unwritten customs and practices. So, I can understand that: Customary tenure defines and regulates how indigenous people / ethnic minority groups gain access to natural resources (land, forests, …) through informal arrangements. The rules of customary tenure determine who in indigenous communities can use which resources. They based on unwritten customs and practices in much case. Securing customary tenure rights of ethnic minority groups is to secure their norm, their traditional cultures, their livelihoods that based on natural resources. Therefore, it is quite important. Law enforcement in Cambodia have to be enforce and speed up. The government structure have to be clear for implementation and avoid overlap between one institutions to another institution. By law and by culture, commune land title need to be protected for respect indigenous people right. They deserve to have their own identity as indigenous. The development project in Cambodia cause so many harmful to indigenous community by breaking the Cambodia law and community culture. The government of Cambodia are too much corrupted and violate the rule of law. - To empower the indigenous people right, by increase awareness, legal education, capacity and legal assistance to indigenous peoples as collective and individual rights are concerning to traditional rights to land and natural resources, freedom and responsibility pertaining to national and international laws, policies and instruments. - To organize indigenous communities to ensure collective rights of community members on land and natural resources in consistence with customary rules, national and international laws and policies. - To build capacity, professional occupation in agriculture and cultural handicraft in order to optimize the use of existing resources for improvement of sustainable livelihood. - To research, document and disseminate all concerned cultural identity documents and indigenous people’s rights in public for advocacy at national and international levels. There have been significant improvements with respect to the legal recognition of the collective land rights of indigenous peoples in Cambodia. The 2001 Land Law was the first to recognise indigenous peoples and their right to collective ownership of their land, particularly in light of the identified need to protect fallow areas that are part of shifting cultivation cycles. The Land Law also outlines interim measures for the protection of indigenous lands until formal land titling is attained. In 2009, the Cambodian government further defined its policy on indigenous peoples and adopted a sub-decree on indigenous land registration detailing procedures for communal land titling of indigenous lands. These provisions on the protection of indigenous peoples’ lands are progressive when compared with other land laws in the region, and are intended to reflect socio-cultural realities and protect the territorial integrity of indigenous areas. Despite these laws and policy frameworks, recognition of indigenous land rights remains a struggle in practice. Progress has been slow. Only a small number of communities have received communal titles so far although many are at different stages in the process. Even if the government could realise its current commitment to register 10 indigenous peoples’ communal land titles per year, it will take many years to register the more than 573 such communities across the country. A key issue has been the long, complicated and costly procedures for obtaining communal land title, which have left untitled communities vulnerable to encroachments by companies, various powerful people and small-scale actors. There are also a number of internal factors that complicate the matter, such as limited understanding or compliance with the internal rules on land use and resource management, the issuing of private land titles within communal land boundaries and land sales, limited capacity and community leadership and lack of law enforcement from mandate government to resolve conflicts. Communal land titles are a key element in protecting indigenous peoples’ land, culture and traditions, enhancing sustainable livelihood development and ensuring peace and prosperity in Cambodia. However, there is a strong need for indigenous communities to reach a common understanding of ongoing problems and to collectively identify and demand improvements in the governance of indigenous peoples’ communal land titling. This includes simplifying procedures and reducing the costs of attaining communal titles for IP communities. Law reform needed, but what works on the ground? Putting aside political reality, perhaps the most effective and efficient way to recognize indigenous peoples’ tenure rights in Cambodia, where I work, would be to amend the 2001 Land Law, which was the first source of indigenous communal land rights in formal law. An amendment could make explicit what is now only vaguely suggested, and which concerns only some but not all traditional indigenous lands: that all such lands, by enactment of this amendment, belong to the indigenous communities (ICs) that are using them, and that these lands may not be provided for any other private purposes whatsoever. The government would have the right, though, to use portions of these lands for public interest projects such as public roads. The amendment could also provide for rapid provisional demarcations of these lands pending formal registration. These provisional demarcations would have to be respected by all persons, institutions, etc. under penalty of law. The amendment could call for these lands to be guarded by the ICs themselves, assisted by government security forces if the ICs wish. Being more realistic, it would be worth seeing whether provisions in the 7th draft of the Environmental Code on indigenous titles are still there when/if the code is adopted, and what these provisions say. Being more realistic yet, I believe it’d be useful and interesting for all participants in this online discussion to share experiences on what concrete steps, actions, tactics, have actually worked in helping ICs protect their traditional lands. One item I can suggest here is the HAGL case in Ratanakiri, Cambodia, where a complaint was made to the World Bank’s IFC because of an investment IFC made in a company that helped to finance the company that displaced a large number of ICs in order to create a rubber plantation. The IFC stepped in and organized a mediation that is ongoing and which has already resulted in the plantation giving up a large amount of land that the Cambodian government had provided for the plantation, and where there is some prospect of further benefits for the ICs. I totally agree with you about amendments the land law. I think that public awareness and legal education are very important for them as well. They need to know their basic right that allow in the law ( domestic and international law) so they are not get violate from the law implementers such as; judges, prosecutor, lawyer and other powerful people. In Cambodia, an inter-ministerial Circular on Interim Protective Measures (IPM) was issued by the Ministry of Interior and the Ministry of Land Management, Urban Planning and Construction (MLMUPC) in 2011. The objective was to further secure land rights of Indigenous’ People Community (IPC). An IPM, issued by the respective Provincial Governor, prohibits the sale, lease, encroachment, or transfer of land claimed by IP communities. It also grants IPC the right to use legal measures to protect their traditional rights. However, an IPM under this Circular is only issued at the final stage of the process, when the community has actually applied for a communal land title with the MLMUPC. In addition, the IPM excludes areas the government has agreed for investment or development prior to IPM coming into effect thus, affected land within existing ELCs is not protected. In the recent interviews with local NGO, provincial land department and local communities, the issuance of IPM became effective 1 to 12 months after the filing of the application to the Provincial Land Department. There were no activities of sale, lease or encroachment in the IPCs’ area after IPMs were issued. Based on this information, one could conclude that IPMs are effective for securing land rights of IPCs. However, IPMs are not 100 percent effectively implemented. It is different from one commune to another. In some cases, the local authorities and relevant stakeholders implement and enforce the IPM but in some areas they don’t. In one real case in the Northeast of Cambodia, after the IPM was issued, an ELC company still continued to clear land without respecting the IPM. It is also noted that the IPM is only an interim solution for securing land rights of the IPCs and it is not a long term solution. It cannot replace tenure security provided by land titles! Furthermore, experience has shown that it can take the Provincial Land Department up to 1-2 years to start land registration activities and issuing titles for an IPC in these areas after the issuance of IPM. These delays create frustration and disappointment by the community members which lead to land sales, mortgages (debts) or even the wish to leave the community. There is no clear answer to the following questions among practitioners and it needs further discussion. 2. Should IPM cover also areas inside ELCs and agreed by government for investment/development or only limited to those areas outside? 3. What is the minimum period for the Provincial Land Department to start land registration after issuing an IPM to avoid the gradual loss of tenure security by IPCs? To this date, customary land tenure has been inadequately recognized in Lao PDR. Most concrete recognition in policy and legislation can be found in the recent final draft of the Lao Land Policy (in form of a Party Resolution) as well as the latest draft of the revised Land Law of 2003. Some mention is also made in the Ministerial Direction 6036 in terms of people’s “traditional right to the use of land”. Since the Lao Government’s campaign to register land and issue land titles in rural areas is progressing rather slowly, a large gap still exists towards untitled land, especially communal land. It must be mentioned that in Lao PDR there are no “exclusive” communities, ethnic or indigenous groups, which would have customary claim to land – communal or private – but all ethnic groups are subject to one and the same policy and legislation. From our perspective, there are 5 major elements that could enhance the recognition and protection of customary tenure. All of these elements have relevance and are interrelated, so they are mentioned here in no particular order of “significance” or possible impact. By utilizing past and current efforts to identify and legally recognize village boundaries, as well as boundaries between productive land and land reserved for protection and conservation, communities should be given a clear mandate to manage the lands within their “jurisdiction”. This would enable a more “bottom-up” approach to land management, relying on the knowledge and experience of the communities, rather than external or government programs and projects. A thorough understanding of land rights and obligations, as well as knowledge of environment, forest protection, agriculture and soils greatly enhances the “ownership” of communities to their surroundings, as well as their own safeguarding of rights. Combined with transparent and effective grievance mechanisms, people are enabled to state their claims and seek assistance in case of conflicts. Any form of land rights transfers that involves the state as a stakeholder, concerning any type of land ownership, should include a compulsory analysis of land tenure by law. The boundaries between state and communal lands in particular are often “blurry”. The customary use and claim of lands must first be clarified with communities in a participatory way. The entire process of granting concessions or negotiating land leases should adhere to the principles of FPIC. Participatory Land Use Planning in the communities can be an effective and powerful tool to enhance customary land tenure recognition and protection. It is essential that the process is truly participatory, to ensure that land use and land claims by the community, or parts of the communities, are not overlooked. The participatory nature of planning also enhances “ownership” by the community and thus leads to better adherence and plan implementation. The three points mentioned above could be included and at least partially fulfilled through Participatory Land Use Planning. Land Management planning and decisions, especially for agriculture and forestry, are a vital part of comprehensive land use planning. A fundamental element of customary tenure recognition is the equal treatment in terms of rights to the land, i.e. rights to protect, use, usufruct, transfer and inherit land. It is a positive step that this equal treatment is mentioned in the draft Land Law. In terms of compensation for land expropriation it is especially important to treat customary land equally to formally titled land. An intermediary step between customarily held tenure and formal titling could be a fast and efficient survey of land plots and creation of comprehensive cadasters without land adjudication. This would enable easier analysis of the tenure situation in case of land transfers or conflicts. Adjudication could be pursued at a later stage on “demand”. Customary tenure is a set of inherited tenure rights recognized by a community in an area with culturally known boundaries. Such tenure rights may not necessarily be only for communal but also family, household or individual. Mostly, such rights are passed through generation and commonly known to indigenous people who may not necessarily be minority. Customary tenure rights are mostly not written down on papers or kept in modern land governance records but kept in memories of communities and commonly safeguarded by community elders or leaders. Customary and traditional tenure arrangements are different in terms of duration of existence, flexibility and non-binding nature to outsiders. Customary tenure right come through ancestral inheritance, are rigid and accepted as commonly known to the indigenous. Customary tenure is not transferable to outsiders with or without consent. Contrarily, traditional tenure arrangements are rights acquired recently by a community, family, households or individuals that may not necessarily represent the customary tenure rights of the indigenous people whether they are majority or minority. Traditional tenure system is safeguarded by groups or individual owner of the rights and transferable with the consent of the owners/owner. However, traditional tenure rights overrides the customary tenure arrangements when the powered balance between the two favours the former. It is important to secure customary tenure rights mainly to protect the cultural way of life, livelihood and spiritual attachment of the indigenous peoples to where they define theirs. There are many organizations working with the aim of securing customary land and many countries have decrees that define legal recognition of customary tenure. Obtaining legal recognition of customary land tenure can help farmers/communities claim the rights to the land that they are currently using. There are a few examples in Lao PDR where farmers have used the national legal framework to claim their customary rights to land. Citizens who have the necessary legal understanding are able to negotiate with the local government through the Ministerial Instructions on Adjudications Pertaining to Land Use and Occupation for Land Registration and Titling (No. 564/NLMA, 2007) that allows for recognition of ownership following a testimony from the village chief and at least four-five neighbouring land owners. Additionally, Article 26 of the Decree on the Implementation of the Land Law (2008, revised in 2013) also recognizes customary land-use rights including those of the village community. Presently, however, legal knowledge regarding land rights and customary tenure remain very limited. In order to put these laws and policy statements into practice, there should be educational or informative programmes which complement the current legal reforms such as the process of the revised Land Policy and Land Law to inform the people of their rights to land and other resources. Educational programmes should also be directed at government staff to increase their understanding of people’s legal rights to land so that they can provide the community with the opportunity to make a claim for customary tenure and provide the appropriate mechanism to deal with disputes. Emphasis should be placed on promoting women’s participation through capacity building and awareness raising. These should focus on the need to change attitudes towards women, especially ethnic minority women and to raise the community’s consciousness about women’s tenure rights. On a practical level, an example of interim protection is when a farmer uses their land user rights to make a claim for their legal right to the land when the government has the capacity to undertake legal registration. Using land user right to claim for customary tenure often applies to farmers who continuously work to develop or invest in their land so as to be able to secure a food supply. However, although this claim for user rights is sometimes used in Lao PDR, it is often dependent on an individual’s ability to prove they have been using the land ‘productively’ and continuously at the household level. This land user right to claim for customary tenure often does not apply to farmers who practice rotational/shifting cultivation and some other type of communal land uses due to lack of evidence to prove continuous use of land. In these cases, communities themselves may take measures to determine access, control, and use of their land and forest resources with the acknowledgement of this process by the local authorities. In some villages in Longsane Valley, Xaysomboune province, Lao PDR, communities claimed their customary tenure rights for communal and individual land by delineating land use boundaries through hand written documentation of traditional land use within those particular communities. These villagers conducted land use mapping (and fencing) and land allocation (sharing based on their land use/development capacity) by themselves (although some villagers ended up claiming a bigger share of land than others), it was in 2004-2005 if I recall correctly. In this case, the local government, which had limited resources to provide assistance with legal registration, acknowledged that the initial mapping could be done by the villagers. UN-HABITAT proposed the ‘continuum of land rights approach’ in 2003 and this was further developed and adopted by the Global Land Tool Network partners. The continuum of tenure types is a range of possible forms of tenure which can be considered as a continuum. Each continuum provides different sets of rights and degrees of security and responsibility. Each enables different degrees of enforcement. Across a continuum, different tenure systems may operate, and plots or dwellings within a settlement may change in status, for instance, if informal settlers are granted titles or leases. Informal and customary tenure systems may retain a sense of legitimacy after being replaced officially by statutory systems, particularly where new systems and laws prove slow to respond to increased or changing needs. Under these circumstances, and where official mechanisms deny the poor legal access to land, people tend to opt for informal and/or customary arrangements to access land in areas that would otherwise be unaffordable or not available (UN-HABITAT:2008). In conclusion, there is an urgent need to have a land information system that works differently and in addition to the conventional land information system. Land tenure types, which are not based on formal cadastral parcels and which are not registered, require new forms of land administration systems. and finally leading to formal land rights. So customary tenure rights are important in the continuum of tenure types to succeed in formal land rights to everyone. There is an urgent need to have a land information system that works differently and in addition to the conventional land information system. Land tenure types, which are not based on formal cadastral parcels and which are not registered, require new forms of land administration systems to address the concern of securing customary tenure rights in Mekong region. The Spatial is an initiative of UN-HABITAT to support the pro-poor land administration. STDM is meant specifically for developing countries, countries with very little cadastral coverage in urban areas with slums, or in rural customary areas. The Land and forest allocation was one of the main programs to recognize the Customary land use rights of local villagers over resource utilization, with one feature being the granting of legal rights through Traditional land uses. The Customary tenure of an individual refers to the protection and use rights of land parcels without any documents certifying land use rights, and that the land parcels have been developed, utilized in a proper manner, long-term, continuously, and regularly. customary tenure is recognized by the state by issuing certificates of land through Traditional land use , case by case, with several supporting pieces of evidence. From a policy perspective, equity is an important issue in land governance. The new form of land governance involves social exclusion, inequity, and ecological simplification. Because of limited of data set, the fairness of land distribution through the registration system may not be predictable. So for the statuary recognition data set is important otherwise, even the statuary recognition may not ensure equity considerations in customary rights.It is possible to combine the customary tenure rights with forestry and agricultural development examples exist in some parts of Laos and Myanmar region, Ghana if not in the entire region. Question 6: There are concerns that the recognition of customary tenure, which often lead to unique categorizations of “indigenous” land where communities can continue to practice “traditional livelihoods” (in some cases with restrictions on community involvement in commercial activities), may not help alleviate conditions of poverty, food insecurity and vulnerability experienced in many communities. Is it possible to combine recognition of customary tenure rights and forestry/agricultural development through investment/commercial activity? Are there examples where this has been done successfully? Over the last few decades, the world has seen increasing recognition of collective land tenure claims lands by national governments. Studies show that norms that govern the internal management of common land and shared resources are defined by subsistence use, sustainability, cooperation, and higher levels of equity than those that undergird a private property system. This automatically pits the logic of land commons against land meant for commercial investments, whose main focus is on profit-maximization. This difference in logic is reflected in the tendency for the way management of commons has been conceptualized e.g. Ostrom’s principles for managing commons, as resources that do not naturally link to markets. Governments also recognize the difference in the logic by categorizing these lands as “indigenous,” “customary” land or community forests. Government laws often reflect this difference in logic. For example in Bolivia, under the 1996 Ley del Servicio Nacional de Reforma Agraria (or “Ley INRA”), indigenous land is not taxed, but also cannot be divided, sold, or mortgaged. Until recently, commercial activities were not permitted in Myanmar’s community forests, reducing people’s incentives to maintain them. In the past, the separation in the logics of land use have not caused challenges to the lives and livelihoods of communities reliant on land commons. In the present day, the market logic of land use interacts with a host of factors that make it harder for local populations to meet their substantive needs: a) increasing population density, which increases the intensity of resource extraction and prevents land fallows from fully regenerating; b) increasing demand on land globally have put more pressure on land commons to be leased to large investors; c) increasing climate change pressures have created erratic shifts that increase the intensity of shocks on local communities; and c) the invasiveness of the market logic have incentivized individual members of communities to leave their commons in an attempt to privatize their shares. Cases from around the world demonstrate how these factors challenge communities to meet their substantive needs. In Bolivia, the sub-optimal soil quality (e.g. only two-thirds of the indigenous land can be cultivated) and restrictions on commercial investments mean routine food insecurity. In Myanmar, the periodic rat infestations in the Chin Hills create precariously high food insecurity for local communities who rely on shifting cultivation. In Liberia, despite the 2009 Community Rights Law intended to give communities management rights over their forest resources, the state has granted over 50% of the country’s land to investors, often without consulting communities living on the land. These land acquisitions have impacted community livelihoods and social cohesion, leading to intra and inter community conflicts. This contradiction-- statutory recognition of indigenous or ancestral land commons, but insecure livelihoods and food security—can be seen in many places around the world. In response, some governments and development programs have introduced interventions to support food production, including improved cultivation techniques, fertilizers and diversification to cash crops. But another solution that requires further support lies in communities being able benefit from more economic opportunities, either with outside investors or in partnership with public funds from the government or development donors, while retaining their traits of cooperation and equity. This is not easy given that market-oriented commercial interventions typically prefer to contract individual farmers rather than bargain with entire communities. Can you think of examples of successful models whereby communities living off land commons have developed successful commercial uses of their land, apart from traditional uses? What kind of laws governing land commons have to be in place to allow this to happen? Where sources of funding are needed to start such initiatives and to make them sustainable? How can development guidance instruments such as FAO’s Governing Tenure Rights to the Commons, a guidance brief for the implementation of the Voluntary Guidelines, be used to facilitate this kind of engagement with communities? Speaking to your first question, the village of B. Hat Nyao in Laos’s Luang Namtha is often given as an example of an upland community that managed to successfully make the transition to a cash crop – in their case, rubber. This village has been visited and written about extensively, to the point that they’re often said to be weary of all the attention. In most versions of their success story, community-based institutions, and specifically a decision to manage the land communally, not allow external ownership, and reallocate land based on changing household labor availability, is said to play a key role. As my colleague and I point out in a recent study, there were also a number of other external factors, including the patronage of a former official who helped the village get a cheap loan from a state bank with which to establish their plantation up front (and thus not fall into the “benefit-sharing” schemes that siphon off significant chunks of the revenue stream to companies under various contract farming deals), but it’s also worth pointing out that this probably also protected the village from external efforts to take their land – it was, in effect, a de facto title that allowed customary institutions to work internally (much as in the communal titling model piloted in Myanmar, as Kirsten Ewers has described). There was also, we point out, the additional factor of a rising price environment during the village’s crucial early years of rubber production (roughly 2003-2008), which cannot be said for many of the communities that invested in rubber in the 2000s, only to have the price crash in 2011-2015 right as their trees were coming into production. So it’s complicated, but this is an example that is, we believe, illustrative in this conversation about successful examples. (2) In the Liberia example, did the law actually grant community ownership in a way that made those concessions legally dubious, or did it merely create a mechanism by which community ownership COULD be created – but the concessions got there first? The latter situation is more like what has happened in Cambodia with communal land titling, as others in this discussion have mentioned. Thanks for your comments. I can provide more details to your question on Liberia. It is more of the option 2 you presented as a parallel to Cambodia. The Community Rights Law Liberia provides communities land use rights to forest resources, but not land ownership right. This means that the community may have use rights over a certain portion of the forest and may transfer that right to a third under private or public arrangement. However, the state has ultimate right over the land space, including the right to outsource that right to a third party, often a concession company. The result is, the state had awarded several forest concession contracts, about 20% of the land space. In the meantime, the state had not paid much attention to community forest use rights. Virtually all customary tenure systems in South-East Asia have elements of collective or communal tenure alongside with individual tenure. When customary land is legally recognized under statutory law, several tenure options should be provided which match the customary tenure rules as closely as possible. For example, this would mean that communal tenure is fully recognised as a separate regime and not as a delegated state land management model. Land registration in customary systems will require some sort of prior mapping of the boundaries and existing land use types in the community (e.g. “land use plans” in Laos, “preliminary maps” in Cambodia, “provisional maps” in Myanmar). Furthermore, customary rules and regulations for local land management should be documented (e.g. “internal rules” in Cambodia, “village regulations” in Laos, “conventions” in Vietnam). These will provide important information on the various tenure regimes (e.g. communal, group-based, individual full-time, individual seasonal, delegated management of state land). Ideally, the legislation would provide full recognition of communal land, but exclude the right to transfer or sell the land. The issue whether communal land rights should include the right to lease the land is widely debated. In Laos, it has been proposed that communal land can be leased to outsiders when 80% of the community members agree. The validity of the title deed should be very long-term or even permanent. If this is the case, another important aspect is the distinction between communal land that is unchangeable or perpetual (e.g. a spiritual forest) and communal land which could be allocated to individual families and recognized as private land in future (e.g. reserved land for agriculture). Shifting cultivation areas including their fallows should be registered as communal land. For the registration of rights in customary areas legal recognition of group tenure is helpful. This would be applicable to sub-groups under the community, associations, user groups etc. which often exist in ethnic villages. This option is e.g. provided by the “collective“ title in Laos. As for communal land, the main emphasis for group tenure must be on long-term tenure security and exclude the right to transfer the land. For individual land in customary tenure areas, one option could be to register the land as private land, but normally this will include the right to transfer and sell or mortgage the parcel. Yet, many ethnic communities will not permit the sale of land to outsiders. As another option, the law could foresee a “restricted” private title, which only allows for sale within the community, but which could eventually be used as collateral. Finally, the community can decide to allow for private use rights within an area registered as communal land. The most important aspect for land registration in customary area is that the community itself needs to decide on which tenure regime and which title applies best to each area. This requires clear information on the rights, but also the restrictions attached to each category. Therefore, registration requires a simplified FPIC approach and a lot of flexibility by the registration team. Ideally, there should be separate title forms for each tenure regime. What are the risks involved in mixing private titles with collective/communal titles in the same customary tenure area? Or should all be collective? Should communities be allowed to lease or concede communal land areas? If yes, why? Is the delegated state land management model good for the registration of customary tenure? Should titles or use certificates be permanent or restricted in time (e.g. 50 years in Vietnam)? leasing communal land areas - should it be allowed? As you are aware, the rapid expansion of commercial agriculture into remote villages has put presssure on communal land. In Bokeo, where i live, I doubt if there is any potentially irrigable communal land (customary title) left that has not been converted to banana plantations. By and large, this was done with the full support of the community because of the high rental prices (up to $2,000/ha/year) - I believe that if this wasn't allowed, then the communal land would have been privatised (via a 'jup jong' or land claim process to ensure its cultivation). I recently came across a concrete example from Ta Oy district in Salavan. Between 2008 and 2011, Stora Enso was able to identify several thousand hectares of communal land in the villages to rent for planting eucalypts on a 30 year lease. However, rising land prices (and fear of government expropriation) have now meant that local villagers are actively claiming the remainder of the customary communal land for private ownership even though they are not cultivating it, and are happy to pay the annual tax penalty to do so in the expectation that they will financially benefit at some future point (50,000 kip/ha/year for undeveloped land vs 15,000 kip/ha/year for cultivated land). This of course creates winners and losers wtihin the village, since the remaining land is not evenly distributed, but goes to those who can afford to pay. In Lapheung village only 6km from town (Ta Oy ethnicity), for example, there is no communal land left beyond the 70 ha initially rented to Stora Enso. So indirectly somewhat, these examples suggest that communal land leased to agribusiness on a communal basis at least keeps it in public ownership in the short term, which may buy sufficient time for formal communal titling to take place at a later date . Dear Florian, thanks for your comments and the posed questions. Generally I believe in the freedom of choice of communities. Like Stuart also suggested, restricting the ability of communities to lease their communal areas for a beneficial purpose would probably rather lead to some "other avenues" for making it happen. I think the key question is how this should be properly and legally organized. Firstly of course, the distinction between unchangeable communal land and changeable has to be made, as you described. Secondly the question of majority consent within the community and the application of FPIC (also within the community) must be clarified. One way to achieve this would be to strengthen the Participatory Land Use Planning tool: Why? Well firstly, communal areas in Laos are registered as plots according to their actual use (e.g. communal live stock area) - not as a single area for the entire community. These land uses are usually determined in a Participatory Land Use Plan. Thus in my view, if a Land Use Plan would actually be regarding as a binding document, any substantial changes to land use (e.g. leasing out the land for a plantation), should undergo some form of updated Land Use Planning process, at least for the area in question. If done properly, this would ensure the participation of the community, their consent, as well as the legal recognition by the local government. I think a big hurdle at this stage in Laos is, that Land Use Planning is often regarded as a "one-off" activity; once it's done, it's ticked off. Move on to the next village. The recurring need for LUP in a changing environment is not (yet) on the agenda. In discussing the recognition of the variety of tenure rights, it’s worth asking who is doing the recognising. Is it the government, or the researchers who are attempting to map the configuration of rights? I believe first the analysts along with communities tease out the variety and configuration of rights, whether they are temporary or permanent and how these rights are endorsed and can be enforced. Thus, to ‘recognise’ would mean to analyse, understand and explain the variety, prior to the government’s legal recognition of Internal Rules for customary tenure in the community when registering customary land rights. The government must first understand the variety and its elements based on researchers’ participatory analysis, together with the communities. We see pure communal rights in large tracts of shifting cultivation land, which comprises the presently cultivated land in a given year, and adjacent land that is fallow plus rocky areas, making up perhaps 10,000 acres for a high-elevation community of 200 households. Allocation of rights in the community may be carried out annually by the community itself, with checks and balances, and is based on equity. Often, land allocation is based on lottery. But it will also cater to the amount of labour a household has for working the land, and its number of dependent family members that are not producers. Lottery can determine which households get rights to which specific plot within the tract that is opened up for cultivation that year. Reserve plots (10-20%) may be kept outside the lottery for later allocation to those with many dependents, who get small plots in the lottery. The system of customary communal tenure ensures that rights in shifting cultivation land accrue to everyone living in the village. There are no landless in shifting cultivation communities. Overlapping the communal lands, we may have rights in the same village territory characterised by "privateness" of these rights. “Privateness” refers to the clarity, specificity, and especially the exclusivity of these rights (McKean, 1998). Privateness of use rights found inside the communal tracts may accrue to a household in the community because of it ritual status, its ancestral status, or because of its investment of labour in the conversion of a plot of land to permanent cultivation, such as terrace, orchard, tea or rubber plantations. Most often, the privateness of rights is established by investing labour. This right tends to be permanent. This right is stronger than the privateness of rights based on ancestral rights, as households with ancestral rights which don’t have the labour in a given year to use all of its specific ancestral land plots will ‘return’ unused plots to a common pool for division among all households in the lottery. Recognising the variety must be based on an a priori recording of the variety and on the community’s agreement to the recording of its Internal Rules, which specify the context of “privateness” of rights and the context of access to communal land. The context for the privateness of rights may stipulate that such privatenesss can be upheld only as long as the one who holds these rights is living in the village. If this person leaves the village the privateness of rights will be distributed to others living in the village. The purpose of recording the variety is that it be reflected in an official endorsement of customary tenure. Such endorsement may be based on a cadastral survey of all the land parcels that make up the communal land (e.g. shifting cultivation land) and the land parcels to which privateness of rights accrue. Alternatively, the recognition may pertain to the total land mass in the village territory that is used customarily, which would include forests. While the latter may reflect the true nature of customary tenure in the eyes of the community, the government at the level of a line ministry would probably not agree to it beyond its character as an interim protection measure. The reason is that agricultural land and forest land belong to two different ministries’ jurisdiction. Privateness of rights that are permanent in customary tenure is a feature that should be recorded as elements of its Internal Rules and written down and agreed upon by the whole community prior to any formal recognition of customary tenure. The Internal Rules may stipulate that privateness of rights can only pertain to households residing in the village. Alternatively, the Internal Rules may allow for the privateness of rights to be alienated to an outsider. In case of the latter, the procedures would always require the whole community to agree prior to alienation of the land. Recognising customary tenure requires a prior understanding of the variety and configuration of rights in each situation. Customary tenure would normally be community-based, with the exception of that of specific forest products that may be shared between two or three neighbouring villages. Land used for agricultural production, often subsistence agriculture, comprising both shifting cultivation land and more permanent taungya, is the land most important to recognise. The meaning of the word ‘tenure’ signifies ‘an enforceable claim’ that can be enforced in the community as part of a customary tenure and it can at the same time be enforced in national regulations. To protect the customary tenure, the aim is to have the government recognise and register as many elements as possible. The rights and claims in customary tenure belong to a body. The Internal Rules will deal with the body comprising the village households and they will deal with outsiders seldom allowing outsiders to claim land in the community except on loan for non-perennial crops. The context of such loans would form part of the Internal Rules. To facilitate the recognition of customary tenure by the government, the government needs to know to whom the tenure belongs in order to register/recognize it. Therefore the community needs to become a legal entity and incorporate legally as an association with clear membership rules that is the entry and exit rules of the legal body, stipulating that only those living in the village physically can have access to land and outlining the governance structure for management of customary tenure in Statutes that is develops with help from professional expertise. These Statutes will refer to dated Internal Rules and outline decision making structures for changing the Internal Rules and for dealing with outsiders, be it households in neighbouring villages borrowing land or companies wanting to lease a part of the community’s communal land. McKean, M., 1998. Common Property: What Is It, What Is It Good For, and What Makes it Work? Investigate to identify and document cases of existing customary tenure system. This could include collection/documentation of different forms of evidences which recognise/prove the existence of customary tenure system in reality. Wherever customary tenure system exist, it should be reflected in the government records/land monitoring data base, along with other types of tenures/ownership. Building capacity for the communities with customary tenures, strengthen community structures, cultures, customs that enable/reinforce the customary tenure system; promote the interlink, maximizing the integration of the traditional community mechanisms in to the official administrative structures and processes. Promote/facilitating the inclusion/interactions of traditional communities’ leader in to the official administrative system. Continue to improve/further pilot community management of land/forest, improve the benefit sharing mechanism and advocate for officialisation/institutionalisation of these mechanism where possible. Engage in, facilitate/ advocate government to develop/complete/revise legislative framework to ensure that the legislative frame works include, clearly define measurement to address the issues relating to customary tenure/the right of indigenous/ethnic minority people. These measurement should be in accordance the the principles of Convention on Indigenous and Tribal People, with FAO/CFS Voluntary guidelines on governance of Tenure (VGGT), as well as other international/regional commitments. Facilitate the participation of indigenous communities with customary tenure systems in to the consultation/negotiations process that will create impacts on the tenure rights and other related rights of the indigenous communities, promote the adoption of, and ensure FPIC principles are applied in consultations processes. Hello everyone, welcome to the second and final week of the dialogue. Thank you to all the contributors who have made this an enriching discussion. Many important issues were raised and there was some interesting interaction and dialogue between contributors as well. Keep it up! At the end of the dialogue, we will produce a short synthesis of the key issues raised, followed by a summary report. For now, I just want to provide a brief overview in reflexive mode. We are seeing a general trend in the Mekong countries towards the formulation of policies and legislation aimed at attributing formal recognition of customary land rights (though in Thailand this trend is more complicated). Notable among these is the development of legislation recognising communal land as a category of tenure that positions communal titling as an important element of customary tenure recognition. In Vietnam, the situation is somewhat different in that policy reforms for ethnic minority land rights have centred on the devolution of state-owned forests to local communities and households. Nevertheless, contributors have raised concerns that these legal developments are not translating into adequate protection and security of customary land for indigenous and local communities. There is dissatisfaction with the limited scale and scope of change, as well as its slow pace. In many cases, there are problems with the laws themselves, many of which continue to restrict who can lay claim to customary land and the size and type of land that can be claimed and managed by indigenous and local communities. One example of this is Cambodia where the statutory recognition of customary tenure is only possible for communities classified by the state as “indigenous” and where land under communal titles is limited to agricultural land, thus excluding important aspects of communities’ livelihood base such as forests. In other cases, such as in Vietnam, there are differing interpretations of laws and inconsistent implementation at the local level. There are also obstacles to communities exercising their rights. These may include cumbersome procedures for obtaining communal titles, or limited access to legal redress in cases of disputes and infringements. We see an extension of state land classifications into communal titles leading to a fracturing of customary systems whose separate components fall under the jurisdiction of multiple ministries. In many countries forest land is administered by forest departments under the Ministry of the Environment, while agricultural land falls under the Ministry of Agriculture. In Laos, for example, participatory land use planning precipitates a logic of organising and titling communal land according to land use type, with different ministries taking responsibility for registering and titling. As various contributors have pointed out, the formalization of customary tenure through communal titling often results in incomplete coverage compared to the land that people actually use, thus actually reducing the amount of land available to villagers. There is the risk that current communal titling efforts could result in a patchwork of ‘islands’, whereby surrounding land (some of which was previously used by villagers) becomes “available” for other purposes. Communal titling can thus be a “double edged sward”: on the one hand, it can provide a means for formalising tenure, thereby increasing security for smallholder farmers, but, on the other hand, it can reduce the amount land available to communities through restrictions that limit the land included in the titled areas, while exposing surrounding land as “available” for the taking. The clear demarcation of boundaries may ‘enclose’ communities to a restricted area, possibly converting communities into “encroachers” if they access resources outside of demarcated areas. In extreme circumstances, it can lead to a significant reduction in communities’ resource base with impoverishing effects. Examples of this can be seen with the Forest and Land Allocation program in Laos, which severely limited communities’ access to shifting cultivation land. A key question, then, is how much land (and of which type) are states willing to give under communal titles? On this note, it is important to reflect on the reasons why we see such slow progress towards greater recognition of customary land. I encourage reflection in week two on the conundrum that many of the policy/legal reforms and titling efforts seem to be donor-led and sometimes go against the grain of host government priorities. What scope is there for expanding the “constituency” for customary tenure recognition? The community has right to decide on what need to be improved in their community, either education, tradition, economic as well as language. To ensure that the investment on mine or industry shall not effect to the community land right. Community’s leader, who is selected by the community member, he or she will become a community representative, in making decision especially to defend the community from outside violation; for example: land violation from the company. Regional dialogues facilitate greater recognition of the rights of the community is very important dialogues in order to promote and protect the community rights in the region. Some countries do not recognize the community as their people for example in Burma; Rohingya people haven’t been recognized by Burma government and the people, thousands of Rohingya have been killed, sexual violation, tortured and forced out of the country. In Vietnam, community often threatened, killed, detention and tortured by the government. Sometimes when they fled away from their country, they often extradited by other states. That is why Regional dialogues recognition the right of the community in the region is very important because it will be improved livelihood, right and travel of the community either in the state or other states. Communities around Myanmar have turned to community forestry (CF) as a way to defend against land grabs and strengthen their claims over forests. CF is the most common mechanism for recognizing community claims over forests within Myanmar’s current legal framework. The Community Forestry Instruction grants 30 year subsistence use rights, renewable, to community forestry user groups upon receipt of a CF certificate. As of 2016, around 840 CF groups were managing around 83,000 ha. A recent revision to the CF Instruction will allow community enterprises to sell products from their forests, legalizing sustainable commercial use of forests with the intention to generate income and reduce poverty. In some areas, CF has been a welcome method for establishing formal claims to customary forest areas. CF groups consistently report that securing tenure is their main motivation for applying for a CF certificate, and have designated CF areas over watershed protection forests, community managed production forests, and degraded forests that have then been planted with timber trees. CF is considered by Forest Department staff a tool to sedentarize shifting cultivation by turning shifting cultivation into forest and agroforest. There is no legal mechanism to recognize tenure for shifting cultivation areas. In some places, then, customary leaders consider CF to undermine customary tenure by limiting claims to forests, sedentarizing shifting cultivation, and changing governance structures. Using CF to assert claims to forest means engaging with a government system that, by design in its current state, ultimately undermines customary claims. - How does CF fit into efforts to protect customary forests? - How closely do CF areas match with customary claims? - Is it useful to have a specific designation for forests apart from customary generally, to encourage maintaining forest cover? - How effective is CF in actually preventing land grabs? Some civil society groups are pushing for blanket recognition of the initiatives of local communities as a model for recognition of customary tenure and related rights. Such calls overlook potential elite capture, the need for gradual building up of minimum standards through checks and balances to prevent wrong practices within the communities or interference by outsiders, and the importance of addressing some of the significant inherent weaknesses in the operation of community-based actors identified by some research. The cornerstone of any policy to protect and recognize customary tenure should be broad-based approach with clear medium- to long-term local development objectives and a reasoned advocacy for compliance with internationally and nationally recognized standards and commitments. Such objectives must focus on compiling evidence to strengthen tenure security and community participation along with support for more livelihood opportunities. It requires careful thought and planning, better sequencing of inputs, building local capacities, and transparent management to realize its full potential. Above all, such an arrangement should deliver equitable and sustainable benefits to everyone, particularly for indigenous, ethnic and local communities. 1. In my opinion, customary tenure is the continuous maintenance and practice of traditional tenure of a certain ethnic group or indigenous community. It is a changing system, which is affected by internal community change, adjustment and external factors, especially statutory laws. Customary tenure is different from “traditional tenure arrangements of indigenous people/ ethnic minorities", because customary tenure can be applied to ethnic majority groups. 2. In order to strengthen the recognition of indigenous, ethnic minority and community tenure rights in the region, it is necessary to act at least three levels. Firstly, practice at grassroots level, real context of customary law, traditional land governance, traditional land use planning or community landscape design, local mapping with local indigenous names should be raised, identified by both local people and their supporters, especially NGOs or civil society organizations. Secondly, the mentioned indigenous values or heritage relating to land and forest should be transferred, integrated and identified by local government authorities. Thirdly, from pilot models or success of the lower level, there should be movement or advocacy for the indigenous land right or land tenure to be recognized by the national legislators. 3. Examples of protection measures for customary tenures: Indigenous or ethnic minority peoples' wisdom and practices of traditional rotational (shifting) cultivation, herbal medicine, non-timber forest collecting and use, handicrafts, etc. is identified and supported by NGOs and local authorities as suitable solutions for stabilization and improvement of community livelihood. 4. The best way to recognize the variety of customary tenure is to recognize community right over their ancestor land and forest and respect their right to decide by themselves on land use style, mechanism to keep collective space or divide land to community members on the basis of their local knowledge. State land titling should be the recognition of the community's land arrangement rather than the state's top-down imposed land use plan, or land allocation, or land titling projects. 5. Differences between statutory and customary tenure system are commonly seen across cultures and political settings. Dilemma in considering and balancing the value of equity between state and community can happen, and it does not always mean state approach is better than community one in terms of gender equality. State may favour and base on a claim of individual equality in access to land, and a [patriarchal] community may be blamed as unfair toward women's rights. However, the state's approach of individual equity is observed to be failed while households or individual's land titles are lost due to land selling to outsiders/accumulators/companies after a short time in many places in Vietnam, especially Central Highland, where village community is strong. On the other hand, it seems a community conserve an unequal share of land, but it should be noted that a community has its own system of adjustment, mutual support and social security to response to this dilemma. So, as long as community members feel comfortable with their tenure settings, community customary tenure should be respected. In the case of conflicts happening in community and people cannot solve internally by their own customary law system, state principle of equal land right access should be applied to solve conflict. In brief, community customary system should be respected and applied first, before any attempting to impose outside values upon a certain community settings. 6. Inclusive discussion and decision among community members should be made before any community members' adoption or change towards land use commercialization. For a community, which maintains more traditional aspect and is more isolated from commercial environment, it is better to respect gradual change of the inherent style of sufficiency. 7. Co-research between NGO, academic researchers and local indigenous representatives on the values of customary land tenure should be conducted, resulting in setting up forums to share results with policy makers, the public and the media. This activity can help outsiders to improve their understanding and know how to respect indigenous values, particularly their land tenure arrangement. More support should be offered to different indigenous communities to visit, exchange views, experiences, build up and strengthen their network for a common voice to protect and promote their land rights as well as customary tenure. Securing customary land rights has been a core issue for indigenous and local communities in the Mekong region. But success stories of legal recognition and securing of land rights, including implementation, varies according to the social and political situation and capacity and preparedness of the communities directly involved. There are also cases of conflict of interests within a community in terms of opting either for individual titles or for a community land title. Further, the question of how well the communities have fared after securing their land rights in terms of management and addressing their livelihood needs varies across the countries and even within a country due to varied reasons. What is interesting to note is that those communities that have a good management plan, with a participatory approach built on their traditional management system and regulation, and well demarcated boundaries (with or without GIS maps) have fared better. This includes communities with no legal recognition to their community land. There are communities that do not have land titles but have successfully used their maps, management plans and good practices as a defence against encroachment by the government or companies. Therefore, preparedness of the community has proven to be crucial both before and after securing of community land titles. No legal recognition of customary land rights: the full legal recognition of land and resource rights is yet to be realised. Even if there is legal recognition (they are at varying degrees in different countries) or good policy on customary land rights, implementation is affected by corruption and faulty governance systems. Constitutions of most of the Asian countries do not support local autonomy nor are they in harmony with the idea of promoting genuine autonomy. Legal pluralism: It is automatically assumed that statuary law is superior to customary law of the communities. This creates tension or gives rise to a legal conflict between customary law and state law even in situations where collective land rights and customary laws are recognised by state law. This is a crucial long-term problem. Economy, business (companies) and banks: Economic and business investment and exploitation of resources are major issues. At the community level, with little options and bargaining power, they are vulnerable to exploitation and manipulation by companies. Further, the difficulty in accessing bank loans once their land is registered as a community land is one major cause of conflict of interest among them. Cultural revitalization programme and direct community action (on the ground) with well-coordinated campaign at the national and international level. Mapping and documentation for evidence-based advocacy and for improving internal resource management and inter-generational knowledge transmission. Signing MoU/MoA with governments for giving legitimacy to the engagement (communities and CSOs with the government). Campaign and lobby with International Financial Institutions (IFIs), investors and companies. Strengthening traditional governance institutions and inclusive planning and governance. Reflection and community inter-learning exchanges. Communities have used a combination of the above strategies/actions depending on their political situation, capacity and resources available to them. In Indonesia, AMAN has been able to combine many of the strategies and actions such as: community mapping, litigation, direct community action, and campaign and advocacy at all relevant levels with impressive gains. This points to the fact that adopting a multi-layered, multi-dimensional strategy can be very effective. Strategies to defend and promote customary land rights must take into account the above three major issues (legal recognition, legal pluralism and business). Capacity building of community for direction action that is led by them on the ground against encroachment and for conducting wider campaigns is most critical. An in-depth learning process is needed as we have realized that it takes time and effort for us to begin to clearly see the extent of destruction caused by decades of rule by authoritarian regimes, militarization and imposition of state structures. Confusion arising from the impact of this within communities cannot be estimated by communities and support organizations as it is something they will continue to deal with in the long term. Reflection and learning must go down to the roots of the communities’ worldview (to overcome many of the confusion we see today within communities), in particular how they see their land and what it means to them. For example, in many communities, when a village was founded, a non-aggression pact between the community and nature was made that the community would not abuse the latter’s generosity and that the community would not exclude the latter in its relationships. The second principle was that wealth and power was not inter-convertible and was not the basis of social relations. Human dignity, as such, was respected and was not subject to materialistic considerations. Members in the community were seen as equal and there was no real authority – whether human or divine – that offers power of sanction. Therefore, in many communities, land was the basis of their direct democracy. So it was almost impossible to think of commercialization. Reflection and learning should include sharing of experiences in the different countries by clearly identifying the actors that are playing crucial role on the ground with the communities. There is still a lot to learn from the ground to understand convergence and complementarity at the broader level and what strategies have worked better. Many of the actions on the ground are in need of linking it to the regional level e.g. targeting investors, companies, IFIs, etc. At the regional level, lessons learned can be drawn up from the ground experiences through inter-learning exchanges and conducting studies for developing a more comprehensive strategy and actionto give visibility to the issues and amplify the efforts on the ground. Customary tenure refers to a system based on traditional rules regulating the organization and functioning of the community. This system also defines the rights and duties of the different member of the community. “Traditional tenure arrangements of indigenous people/ ethnic minorities” is quite different from customary tenure according to the particularities of the members of the communities: indigenous people (referring to hunter-gatherers and pastoralists). These arrangements only refer to their rights and duties. Response to question 2 and 7: Overcome immediate concerns before looking forward. 3- Establish a dialogue process between local and state authorities to exchange on different aspects of customary tenure and bring down tensions. Also the recognition of the said rights can be obtained trough international and regional agreements signature, ratification and national incorporation measures. In this context, countries are free to join these agreements, ratify and take national implementation measures. Therefore the main problem is to bring the said countries to take national measures to implement these international agreements. Response to question 4: Processes harmonization. The best way to solve the problem of mixture commune land and plots claimed individual families is to harmonized processes for land allocating to both categories into one document. The said harmonization should take into consideration requirements, rights and needs of local administration, industries, community and individuals (protection of rights of the population against land abusive embezzlements, enhancing compensation rules, local development requirements, protection and enhancing collective rights within industrial investment. Response to question 5: Women capacity building. The best way to ensure that equity considerations are adhered to in customary systems is to empower women on the impact of women leadership in land decision-making institutions and processes. Women should be more sensitized about gender issues, their rights, leadership and the impact they have in local development with land. This will lead them to be more independent in fighting for their right. Also, it is important to sensitize traditional authorities on gender issues and the rightness of women to be part in decision-making processes. Women’s presence in decision- making institutions will therefore will influent in the most effective manner customary systems in taking gender requirements. Local leaders, women, community - YES! Thank you, Sophie Ruth, for highlighting just how important local leaders, women, and other community members are in claiming and managing customary tenure, especially in a changing context. In the Mekong region, women are often at the forefront in advocating land issues. "Land' is often described as a women's issue since it is closely tied to household security and to making sure that the children are fed and housed. However, women are not necessarily well-represented in local government leadership. The elevation of women, from rural and indigenous communities, to such roles might motivate some interesting shifts in how land conflicts are perceived and negotiated. Vietnam has established a policy - legal framework of land governance with strong commitments to ensuring the rights to access to land of the people (including small-scale farmer households, especially ethnic minorities, women and the poor - marginalized groups), the right to provide relevant information, the right to be consulted and participate in the relevant steps of the State management cycle from planning, decision-making to implementation and monitoring (Land Law 2013, as well as documents guiding the implementation of the Government, the Prime Minister and the ministries at the central level). However, in general a big gap between the policies in paper and the implementation in practice still exists and land is still a "hot" issue in Vietnam. After nearly 10 years working with ethnic minorities in the North mountainous areas of Vietnam, RIC realizes that participatory dialogue is one of the most effective methods to solve land problems in our working areas, thus, we would like to share our experiences on how we organize dialogue (at communal level) to solve land issues. Dialogue is a communication between stakeholders in order to share information and explore perspectives to understand each other better, to connect with each other, to remove barriers and to find opportunities together. Secondly, ensure that representatives of all relevant stakeholders (local authorities, companies, local people…) are invited and able to attend the dialogue. In our working areas, for example, we often invite the highest local government authorities who can make decision to solve the problem; and local people who are really in need (especially women, poor people, vulnerable groups…). Last but not least, a successful dialogue need a facilitator to ensure the whole process is really a dialogue discussion instead of a debate. We often have two facilitators to facilitate a dialogue: one is representative of Father Land Front or People’s Council to manage and ensure participation of the entire relevant stakeholder and one is representative of community to record the minutes and visualize questions/comments of the participants. The facilitators are not only mobilizing participation of all relevant stakeholders but also ensure that all concerns/questions have answer and all participants are satisfied with the answers. Sometimes color cards will be used to collect opinions of the participants who are too timid to speak out. All important information in the dialogue must be visualized in big sheet paper or color cards in an easy-to-understand way. Representatives of relevant stakeholders (local authorities…) will answer/solve questions/concerns that rose by the participants within their jurisdiction. For the issues that they cannot solve immediately, they will submit to higher level (district authorities …) or/and make plan to solve after the dialogue. At the end of a dialogue, all relevant stakeholders will together discuss to find out solutions and make plan to improve/solve issues mentioned but did not have answers in the dialogues. Community representatives will follow up the implementation process of the plan after the dialogue. The indigenous community has right to farm, business or live on their land. Customary tenure is a part of their life which they actually have it since they first born. This is a very important part that only them who can decide for their destination whether they want an investment for their land or leave it original. With the initiative and supported by local or international NGOs and in order to promote livelihood in the communities, some communities have ran the eco-tourism for the domestic and international tourists. So this can help them to gains more income for support their families as well as maintain the forest, the tradition and custom in the community. Sometimes, moving forward requires a look backward. The failure to take this suggestion, both in Laos and elsewhere, testifies to the difficulty of what the team that made it was trying to do. Taking this suggestion would have meant a different set of priorities: rural protection rather than urban and peri-urban land markets; tenure security rather than using land as collateral; a willingness to see “land” and “forest” as part of the same livelihood base rather than different bureaucratic sectors. A lot has happened in the last fifteen years – most importantly, the concession boom. Yet in many ways, efforts to secure recognition of customary land uses are often still stuck in this mode of “individual field” recognition. As this discussion has highlighted, the successes associated with this approach are limited, the coverage of community titles is small, and its progress is slow. It is hardly a stretch to say that it is often too little, too late. This is no doubt due to a whole range of power imbalances; it reflects people and projects going forward and doing what they could, rather than what they had initially planned. But strategy is the art of figuring out what to do when the odds are against you. It is thus an appropriate note on which to wrap up this discussion. Given the lessons so far, I want to suggest three strategies for moving forward. These are described in general terms, as the specifics will no doubt vary by context. 1. Continue taking existing legal frameworks to the field. Despite numerous shortcomings with current legal frameworks, there are at least two good reasons to continue trying to implement them through collaborative, grassroots approaches: first, they offer some real possibilities to enhance tenure security, as noted by at least one post in this forum; and second, these efforts will help create the political pressure to reform laws and institutions as the limits and contradictions are encountered and understood not just by experts and offiials, but by affected communities. 2. Expand efforts to make concessions more transparent, and link this explicitly to the issue of customary tenure recognition. Concessions of various categories of state/wasteland are, in essence, the negative image of customary tenure recognition: it’s hard to have both in the same place. Bringing these discussions together through, among other things, bringing added spatial- and process-based transparency to concession-making, will help force the issue. Among other things, this type of work could help make “tenure risk” less of an abstraction, and more of a concrete issue that private sector actors would be forced to engage with. 3. Put area-based recognition explicitly (back) on the agenda. This is easy to say and harder to do; there are myriad legal and bureaucratic barriers, many of which reflect the entrenchment of the plot-based approach to land registration – i.e. titling – over the last few decades, including the all-important decade and a half since the team quoted above. But it must be said that at least some of the legal and bureaucratic barriers represent foot-dragging by policy-makers who saw (and often still see) area-based tenure recognition as both anti-development and, when it comes to forests, anti-conservation. There is a strong case to be made against both of these positions, and embracing territorial recognition is likely to be a key piece of such an approach. Millions of farmers in the Mekong region access resources crucial to their livelihoods through customary tenure regimes. More difficult to determine is the extent of coverage of land under customary tenure, how these claims overlap with state land and concessions, and how secure this access is. Customary tenure covers agricultural land as well as forestland, grazing land and fishing areas (see here). Customary systems include both land that is managed collectively and areas with individual/family/clan claims (see here). There is a continuum between communal and private rights, with various intermediate rights: for example, the right to cultivate a plot of land as long as the family is in the village and to sell that land within the village, but not to outsiders. Although customary tenure systems are more prominent in upland areas and often associated with the land practices of indigenous and ethnic minority groups, customary tenure is not restricted to indigenous peoples or linked to particular ethnic groups. Customary tenure is also important for lowland communities and their management of communal forests, grazing land and fisheries. Some non-indigenous groups engage in forms of rotational swidden cultivation, often in conjunction with paddy rice cultivation. Important also is that many villages are now composed of mixed ethnicities, due to migration and resettlement. The above is not intended as an exhaustive or definitive list of what is/is not customary tenure, but rather to highlight that, based on the above understandings, we can already see various forms of exclusion in the way customary tenure is recognised in this region. Addressing these may require taking a step back and asking: what is it important to recognize under customary tenure, for whom and why? Clearly the level of recognition of customary tenure by states in the region remains limited, however, recent policy and legal developments in the Mekong countries do suggest that governments are prepared to embrace some form of community-based recognition. 1. Discussion over the technical details of how things are/are not working now. 2. Political discussion of how to build a broad-based constituency and strengthen the power base for communities attain and defend more than what currently exists. Many discussants have pointed to the complicated, multi-step procedures that make communal land registration and titling a long and costly process (e.g. Cambodia), allowing time for encroachments to occur and even accelerate. In Laos, too, we see a similar pattern developing with pilots where resource-intensive participatory land use plans (PLUP) and associated land management plans are increasingly seen as a precondition for registration of land parcels based on land use (see here). This raises concerns about the future pace at which communal registration will occur once the new Land Law is adopted, as well as the size and coverage of the plots. In Vietnam, the process of allocating land to ethnic minorities is less clear but involves lengthy and complex bureaucratic processes through various local levels of administration. All this leads us to a search for alternative modalities for customary tenure recognition that involve simplified procedures that are affordable, accessible and transparent. On this point, the suggestion that we need to work with what already exists (e.g. village territories) and to revisit an “area-based” approach to tenure recognition (as per the Philippines, for example) is pertinent. Reflecting on these lessons is critical, particularly in the light of Myanmar’s critical juncture with customary tenure recognition (see here). The search for more simplified procedures may also require moving beyond current fixations with technical accuracy. It may be more feasible to start with the preliminary participatory mapping of village boundaries that can cover larger areas with fewer resources. Local authorities may approve these maps without the need to go through final and authoritative determinations of existing rights and claims. In this sense, Myanmar has lessons to share with the other countries, as various local groups have already started working with communities to document their customary systems and produce participatory maps, and entering into dialogue with village track administrators for government approval. Identifying allies within government who are willing to collaborate and push the envelope on customary tenure recognition is important. There is a sense that donors supporting the recognition of customary tenure/communal land titling are moving in different directions. Coordinated strategies could help harmonise and strengthen current efforts to bend policies and institutions in more progressive directions. It may not be enough to focus only on strengthening tenure recognition through formalization. This needs to be combined with a number of other strategies, including addressing the key threats to community land – i.e. concessions (see here). More broadly, there is space for further questioning of current models of large-scale agricultural development, particularly since many are not generating the expected economic returns and are generating greater levels of inequality. Others have highlight the importance that preparedness of communities has both before and after securing of community land titles. Building the capacity of communities to lead the development of maps and management plans (as opposed to waiting for the government to grant recognition) can be an effective measure against encroachment by the state and companies. Finally, the private sector also needs to be held accountable for its role in changing norms and practices toward greater recognition of customary land rights (see here). It must be stressed that companies with legitimate intentions to invest for long-term business may also have vested interest in a transparent process for recognition of customary rights to increase the security of their investments, avoid conflicts and reduce reputational, financial and political risk. In this area, a “carrot and stick” approach may be needed, involving both collaborative approaches to work with companies to improve practices as well as more confrontational approaches that expose the actual ‘risk’ of non-compliance. Thank you again to everyone for your amazing efforts and spirit of generosity that made this a lively, interesting and constructive discussion. Special thanks go to Mike Dwyer for background support and helpful discussions. Thank you also to everyone who provided early contributions that helped frame the key issues outlined in the questions. Last but not least, thank you to all the people from outside of mainland Southeast Asia who offered useful comparative perspectives from other parts of the world. Please note that we have extended this dialogue to Monday (27th) in case you would like to react or respond to the final round of comments, or share your views on this dialogue more generally. As a final comment, I'd like to say that I think this discussion has been a useful forum for clarifying concepts and problematising simplistic notions of customary tenure and its recognition, which is quite helpful for informing public debate for which other (offline) spaces are obviously necessary. I hope we can take these lessons into future arenas of deliberation and collaborative action. I want to comment on the area-based approach and reference to the Philippines. In Myanmar and Cambodia, it is the VILLAGE which holds customary tenure, cf Cupet a French traveler remarked in 1893 that “the savages’ society is essentially anarchic and it has only one centre, the village.” He further noted that, “in the same people, the villages maintain their autonomy and they are in no way grouped under one authority". In the Philippines each of the ancestral domains in the Philippines is made up of the combined territories of the whole indigenous people/tribe living in many neighboring villages, often synonymous with a present-day local administrative authority. In the Philippines there is no requirement for legal incorporation of the right-holding entity. This requirement of a legal status may have been resolved in the Philippines by awarding collective title to local government institutions in areas wherenthe local populations are mainly indigenous. For example, the Higa-onon is a large ancestral domain, covering 10,054.88 hectares within the areas of the two local government authorities of Impasug-ong and Malitbog in Mindanao, hosting seven to eight communities, forests and sacred places. In Cambodia the communal registration may reach a maximum of 1500 ha only because it is for one village and this is as Cupet noticed the entity holding customary tenure. Similarly in Myanmar. Each village on its own with possibly Internal Rules for LENDING land to a neighbouring village if no perennials are planted. So the area-based approach has to be a village territory based approach and not like the Philippines. It’s been exciting to see such lively discussion on this platform over the last two weeks. The richness of the dialogue has proven how useful such a platform can be in engaging a range of people to share ideas and experiences even across borders. The soon-to-be launched Mekong Land Information and Knowledge Exchange (MLIKE) will continue this practice with at least two more dialogues anticipated this year. We will use the experience and learning from this pilot dialogue to improve the facility for the future. The anticipated MLIKE website will also provide users with easy access to a variety of resources, data sources, and tools to facilitate and enhance cooperation and learning between a range of groups concerned with land issues in the Mekong region. Since the website will be hosted within the Land Portal’s global platform this will also strengthen information sharing and knowledge exchange with land practitioners, researchers and activists around the world. As a follow-up to this discussion, you may be interested in reading more on customary tenure issues. Here are some suggested resources. You may also access the Voluntary Guidelines on the Responsible Governance of Tenure (VGGT) in Khmer and Lao language. Chiang Mai University’s Resource Center for Social Development is hosting the Mekong Land Research Forum, which also aggregates land-related research. Their repository includes a wealth of information on customary tenure and other land issues. A report summarizing this dialogue will be available here on this discussion board before the end of March. The report will also be accessible via the Land Portal’s library and Open Development Mekong, an online platform aggregating information and data on development issues in the Mekong region. We look forward to you participating in other discussions later in the year. Thank you for your interest, your participation, and your commitment to strengthening land governance in our region. We hope to see you on MLIKE. Five Myanmar civil society organizations and ethnic youth organizations documented local Customary Tenure practices in several villages in Shan North, Shan South, Magwe and Kayah states.